Red Solo Cups– the hottest American Souvenir? Could the ubiquitous red Solo cup be an American cultural icon? Solo cups have been around for as long as I can remember. As a child, I drank cokes from glossy red cups at every family barbeque.In high school, we used the opaque red solo cups to disguise illicit beverages. At any sign of the police (or a busybody parent), all it took was a quick flick of the wrist and the evidence was gone. In college, we scooped up sleeves of red Solo cups for keg parties and tailgates. At sixteen ounces and only pennies a cup, they were large enough that refills were kept to a minimum and cheap enough that clean up was a snap– we tossed ours into giant garbage bags. Cheap and cheery, stackable and disposable– red Solo cups are the cup of choice for any American party. Photo by Nick’s Travel Bug. Red Solo Cups: Representing American “Party” Culture? To Americans who have grown up with red Solo cups, they are just party accessories, mundane objects that are no more interesting than a paper plate or a napkin. So I was surprised to learn that some non-Americans (especially younger Europeans) seek out red Solo cups as an iconic American souvenir. You may be curious, as I was, how foreigners even know about these cups? Non-Americans watch lots of Hollywood films, and red Solo cups practically play a supporting role in any movie with a bitchin’ high school/college party scene. Just watch any of the American Pie flicks (or anything starring Jason Biggs) and check out the frat, keg, or toga party scenes– red cups are everywhere. Predictably, once those red cups make an appearance in a film, further shenanigans are sure to follow. Every time I drink any drink from it I feel like I’m in american pie! brilliant! Everyone loved the American cups! They really added a special something to the night! I can’t believe that these are the REAL solo red cups from America. These will absolutely MAKE my party and I can’t wait. American-themed parties are popular throughout Europe— along with the essential red party cups, a proper American party will have a few flags thrown up as decor and serve American treats like Reese’s pieces and Hershey’s kisses. Once the party is over though, no one would dream of tossing their red cups away– they are carefully washed and saved for reuse. 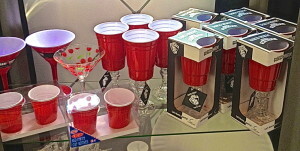 For my non-American readers who are interested in bringing home red Solo cups for a souvenir, my tips are simple: walk into any party store, big box store, drugstore or supermarket. Look for the long shelf (or even multiple shelves) of cups available– you’ll find many size, brand and even color options (while red is classic, blue is the second most popular color). 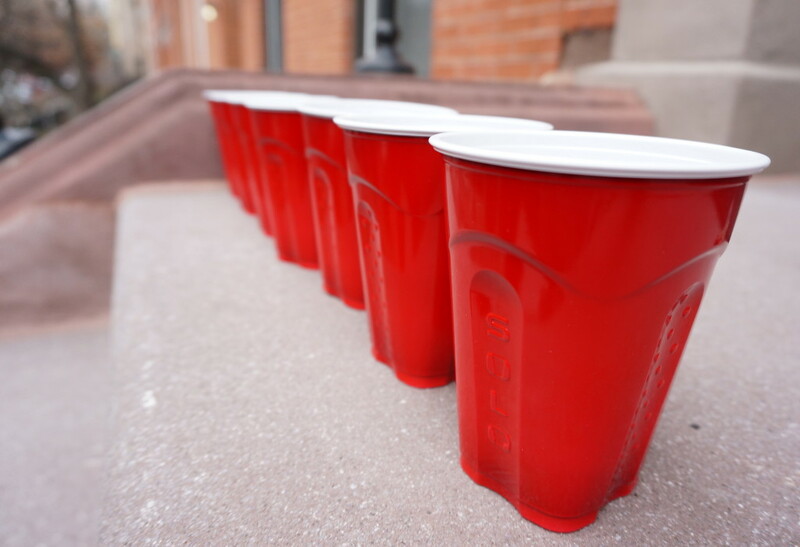 Once you bring your Solo cups home, impress your friends by setting up a classic American drinking game popular on college campuses everywhere– beer pong. 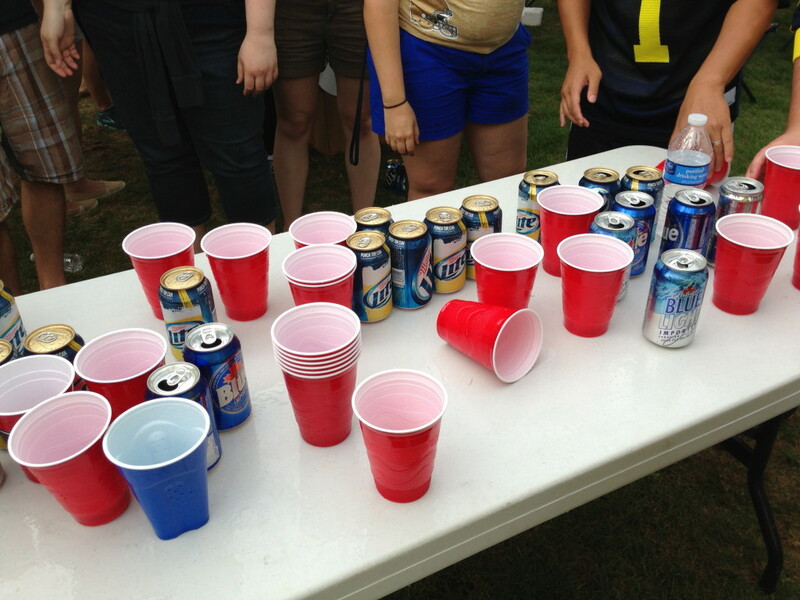 The classic beer pong set up. 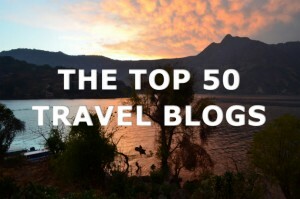 Photo courtesy Nicks Travel Bug. To start, each team sets up plastic solo cups (6 or 10 depending on the style) in the shape of a triangle. The cups are then filled roughly 1/3 of the way with the beer of your choice. The object of the game is to throw a ping pong ball into the other team’s cups and requires the utmost hand-eye coordination. Each team gets 2 shots per turn and if both are made then the team gets the balls back to shoot again. Also, 2 re-racks are permitted per game to allow each team to create an optimal formation to shoot at. Note: there is a direct correlation between the number of games played and diminishing hand-eye coordination, especially if a team “runs” the table for several games. There are various “house rules” depending on who you play with. For example, if a ball is bounced on the table and made into a cup, then 2 cups will be removed from the formation. However, in the event of a bounce the opposing team may swat the ball away to avoid the loss of 2 cups. 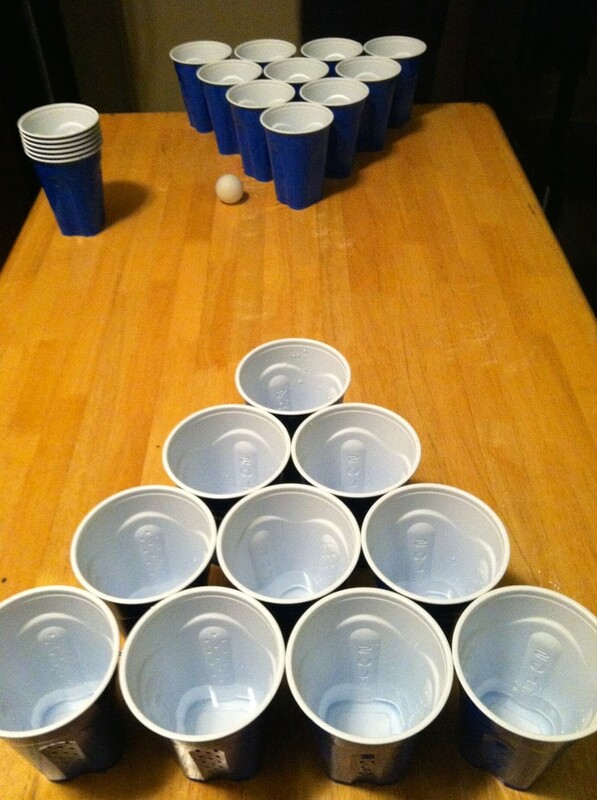 Beer pong can be a very competitive game, but a great way to make new friends at a party. Love your red solo cup so much that you prefer to drink from them on more formal occasions? 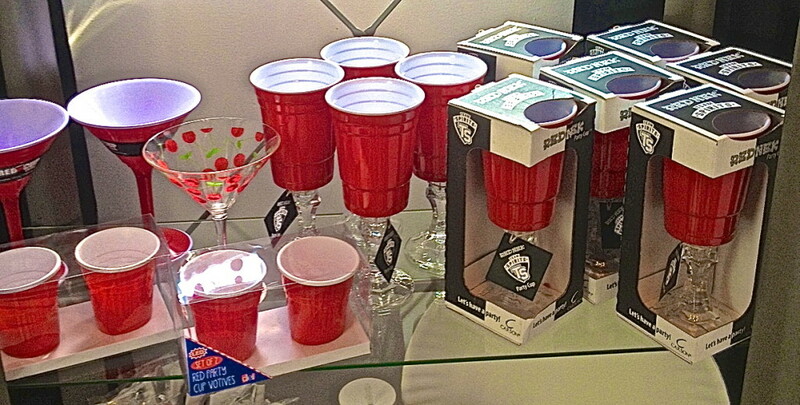 American retailers have you covered– you can pick up your red cups mounted on faux crystal stems or molded into the shape of a martini or shot glass at select American gift shops. Photo by Beverly Sill. 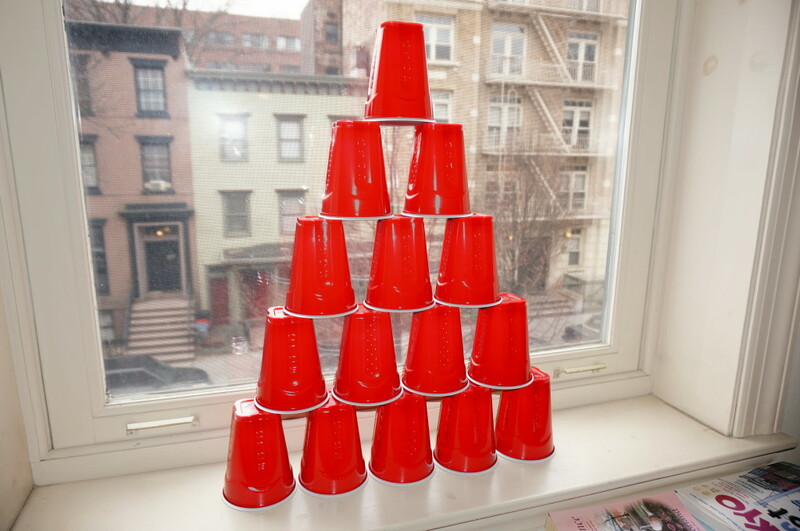 Red solo cups– fun for stacking. 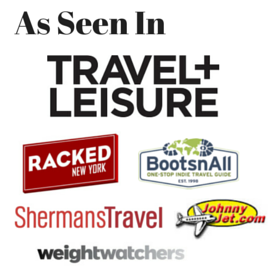 Where to buy: Any American drug store, supermarket or party store. Non-Americans, have you ever considering buying red Solo cups as a souvenir? Or hosted an American-themed party? Share your party tips in the comments below! 12 Responses to Red Solo Cups– the hottest American Souvenir? Isn’t it funny? I read about it in a Reddit post– it seemed to be one of the most popular US souvenirs (along with Bass hats). 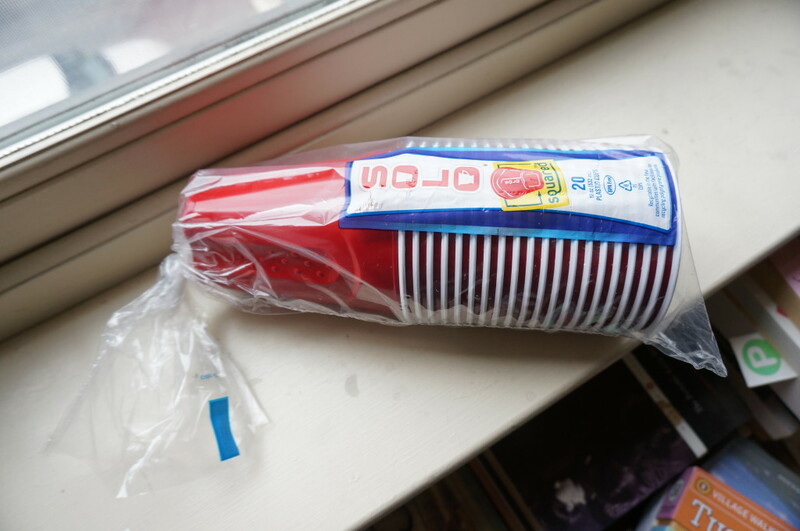 I went to California (Berkeley), and we have to go to fairly great lengths to find Blue Solo Cups, because red is the color of our hated rival, Stanford, and we would rather die than drink from a red cup. I’m surprised Nick doesn’t have the same problem with his Michigan/Ohio St situation. Awesome article, nice job, Nick!! LOL, just noticed that in Nick’s picture, the cups are blue. I guarantee it is because of Michigan! Hi Kevin! When I put a call out for red cup photos, Nick had to search for red ones at all– as you mentioned, all he had were Michigan blue! Funny I had no idea that school colors impacted even cup choices– I went to a non-football school (Georgetown) so I’m not even sure what our colors are! Ah it’s true then! That’s so funny thanks for commenting! Fun fact : the lines on them denote measurements for a shot, beer, or wine. Ah who would have guessed?